Sun-glo 2 ply wool produced by F.W. Hughes Pty Ltd at the Alexandria Spinning Mills, Sydney, NSW, c.1950-60. 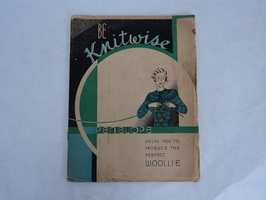 This hank of knitting yarn was manufactured under the brand name 'Sun-glo' and was produced by F.W. Hughes Pty Ltd at the Alexandria Spinning Mills in Sydney.